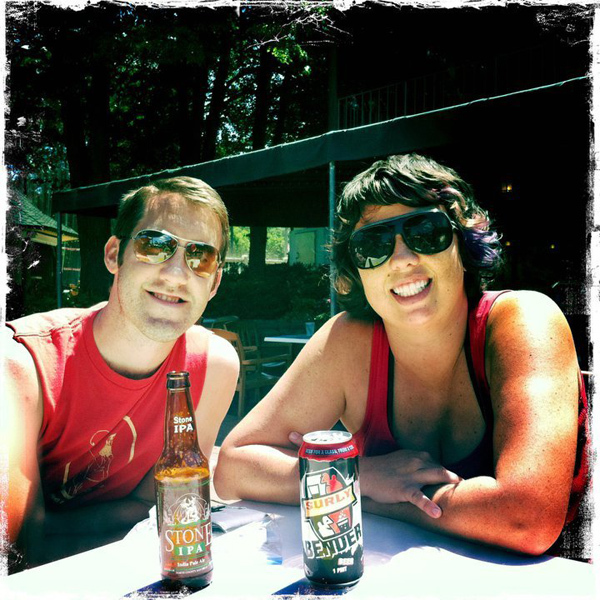 Craft Beer and Dog Parks – What’s yours? As many fulltimers may already know, once you finally break free from the “real world” and give yourself the opportunity to do whatever you want, whenever you want, wherever you want, the options can soon become vast and overwhelming. Not a huge problem to have in the grand scheme of things, but it can make travel planning a bit more difficult. When Brian and I first started out on the road just over a year ago, all we knew is we were going West. Our first stop was in Colorado Springs and we had no clue what to do, so we looked up a brewery and headed for a beer. It turned out to be the most pivotal decision on our trip. Seeking brewery after brewery not only allowed us to see incredible scenery and seek out destinations we never would have discovered otherwise, but even more beneficial was the advice we would get from the locals we would talk to at the brewery. Brian and I joke that it’s our “Visitor Center” when we go to a new city and don’t know anyone we just belly up at the bar and wahllah, you’ve got tips on the best places to eat, see, hike, whatever your pleasure! After we left Colorado we had visited nearly 20 breweries, which really isn’t that hard to do (there are just over 110 total) but incredible when I look back at it, seeing as we were only in CO just over a week. We’ve slowed our travel pace down quite considerably since then, but the brewery visits have continued. 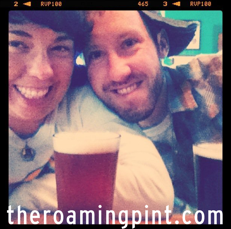 To date we’ve been to 120 breweries and now write about all our visits at TheRoamingPint.com – If you are interested at all in brewery stops while you travel and would like advice just let us know! We love talking brewery visits with people and if we haven’t been to an area yet, chances are I can find some of my beer friends that have and get tips from them. We have also found that RVing to breweries sometimes can be very convenient, street parking nearby or in some cases just crashing in their parking lot! If there was anything worse than driving drunk it may be driving your home drunk, so just don’t do it. It’s not necessary! After talking with other NuRVer friends we realized it is common to have something to seek out while you travel. Many people we’ve met like to seek out hot springs or outdoor adventures. Sometimes you may seek out a certain food or maybe even wacky roadside attractions. Or if you are like us and have dogs, possibly you seek out dog parks (we like to use the Dog Park Finder iPhone app, brought to you by DogParkUSA.com – very convenient!) We even heard a story of a man that traveled to document every single Martin Luther King Jr. street in America! So now it’s your turn… when you travel what do you seek out? We just arrived in Milwaukee and all I can think of is this the Alice Cooper scene from Wayne’s World. Hey! We are still here! It’s been months since I’ve posted! I’ve been working on some new projects the past few months but assure you we are still Trippin! 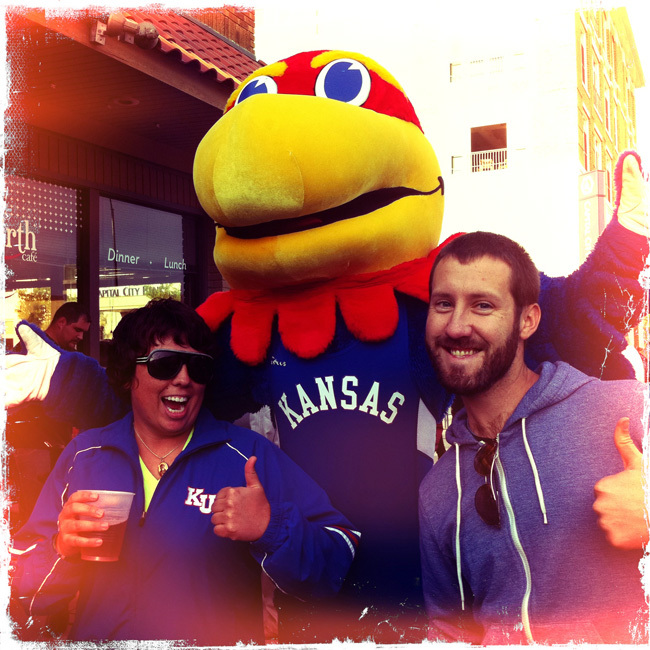 We spent most of our Spring in Kansas from the end of March until early June (conveniently waiting out the gas spike!) then spent 2 weeks in Omaha and now we are up north in Minn-e-sOda. We have big brewery tour plans for the Summer while we make our way a little further east into Wisconsin and Michigan. Brian continues to work on Popstar and Cool Products stuff and I’m trying to get The Roaming Pint website up and running. Hoping it’s not long now, although it will be months of continuing to get it into shape! Hit us up and let us know you’re still out there, we love hearing from you! A better more updated post in a couple weeks I promise!! 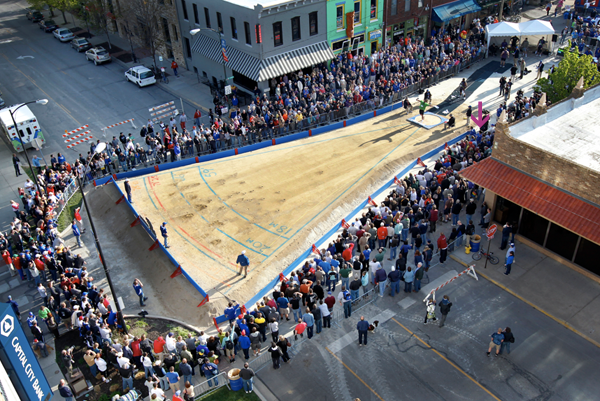 Every year the Kansas Relays draws some of the top track and field athletes in the world to Lawrence, KS. 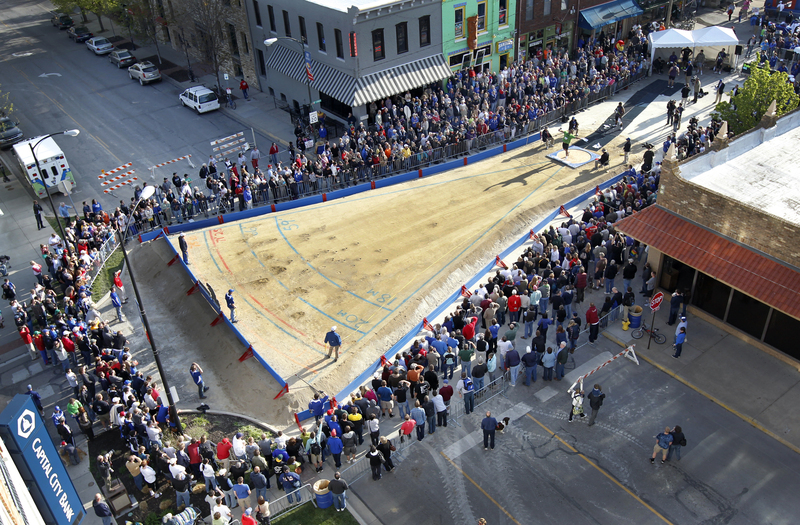 Normally all events are carried out near Memorial Stadium but this year event organizers decided to bring track and field to the people, and thus 125 cubic feet of limestone was laid onto 8th street to erect a shot put pit in downtown Lawrence. We were lucky enough to be in town when this went down and grabbed some primo spots right next to where the shot-puters were throwing (see arrow). It was quite impressive to some of the top competitors at this sport heaving a solid metal ball down the street. 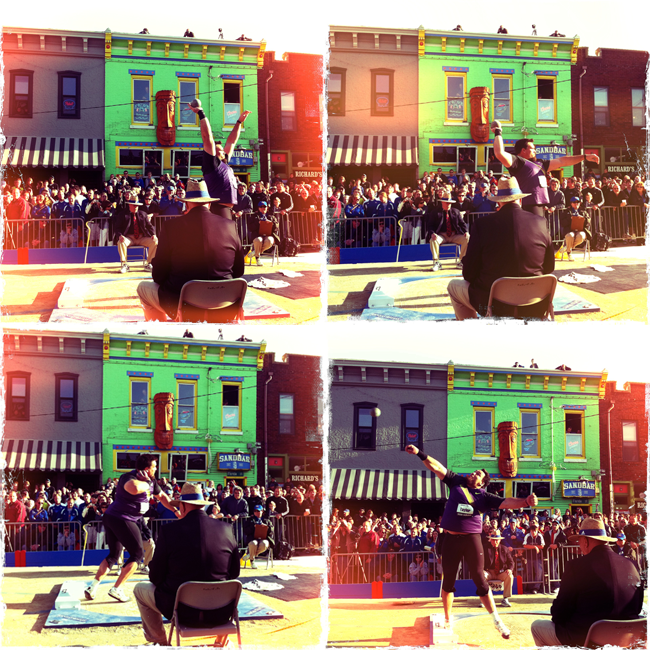 It put my 8th grade shot put accomplishment of 2nd in the city to shame. The weather was great and we had enough foresight to fill a back pack full of beers. The only hiccups in the event were a couple throws that approached leaving the puting area and a couple that hit a power line that was hanging a bit too low. All in all a well spent evening in our home away from mobile home, Lawrence. Tags: about us, You Trippin! Who is Stanley? Well, Stanley is our RV! He takes us all around the U.S. to taste delicious craft beers and meet new friends along the way. We work from the road, Brian is a graphic designer and I am a professional beer taster. I like to call our lifestyle: Working on not working and so far I would say it is working out pretty well. 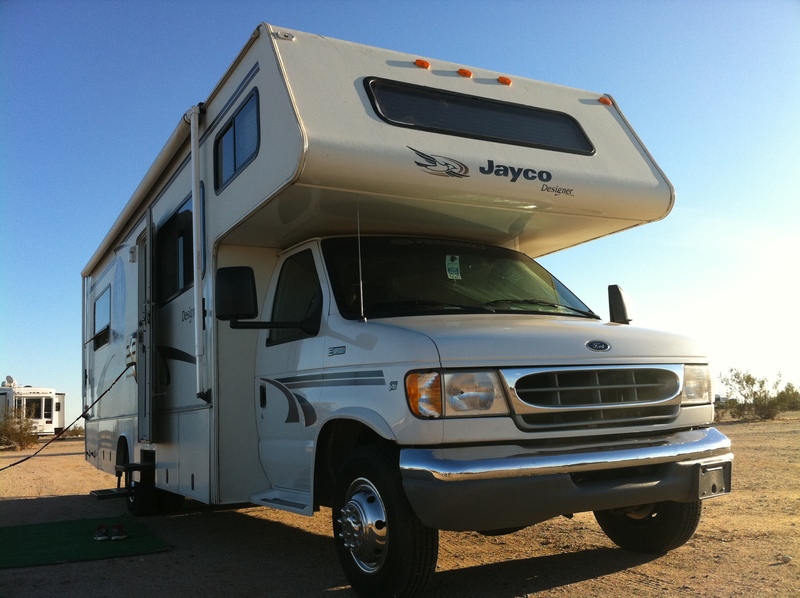 We embarked on our RV journey with Stanley in August 2010. 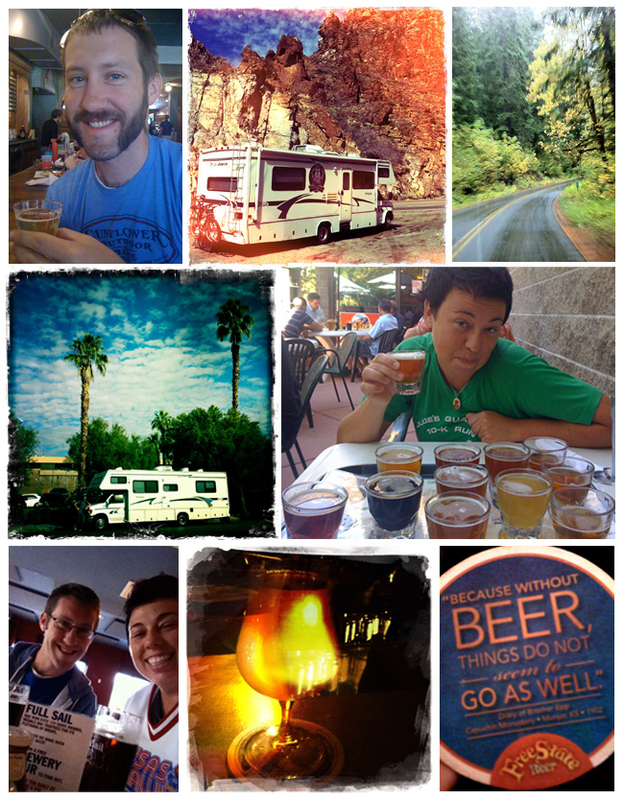 So far we have visited over 13 states and nearly 80 breweries along the way. When we first started our trip we hadn’t planned on visiting so many breweries, but when the first state you visit is Colorado, packed full of some of the countries best breweries, and you don’t have an agenda a brewery is a great way to familiarize yourself with a city and most importantly the locals! 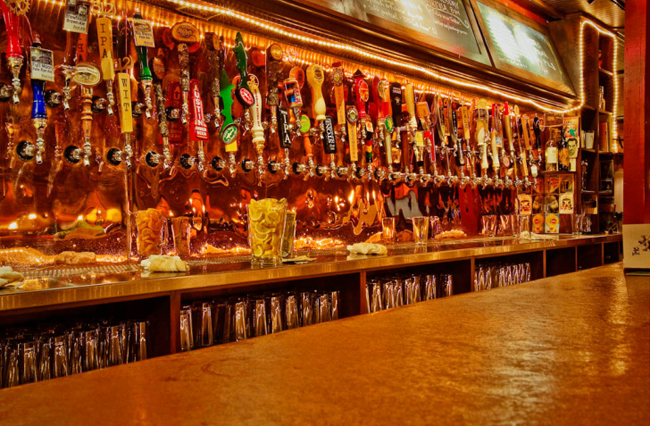 Breweries are typically located in prime neighborhoods across the US or sometimes, even better, located in off-the-beaten-path locations that you might not have thought to seek out. Now that we have started this traveling tradition we figure it is too good to stop! If you are new to the Stanley blog, Welcome! Thanks for stopping by! If you’ve visited our blog before, thanks for following us on our journey! There are going to be some changes these next few months to the blog. We are currently hanging out in Lawrence, Kansas (where we consider “home”) resting and reuniting with our friends, getting ready to embark on the “second leg” of our trip, June 2011. Previously we were using the TrippinWithStanley blog to update family and friends on our travels, but now we plan to focus this blog more on our love of learning more about beer. 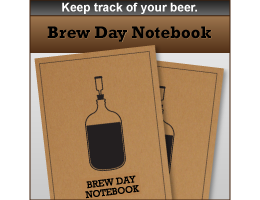 TrippinWithStanley will soon feature brewery reviews, beer reviews, master brewer and home brewer interviews. We are also on Facebook now and will be using that more to update family and friends of our traveling antics. Give us a “like” if you want, we hope to bring you big things so keep in touch for all the latest news. We are excited for the upcoming site updates and second leg of our trip. Thanks for following! 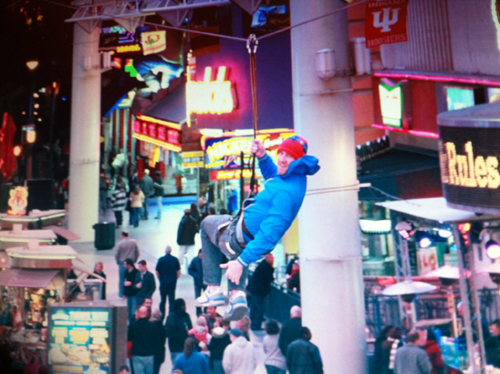 Our buddy Dane informed us that there was a zip line through the Freemont Experience in downtown Las Vegas and we decided to check it out. 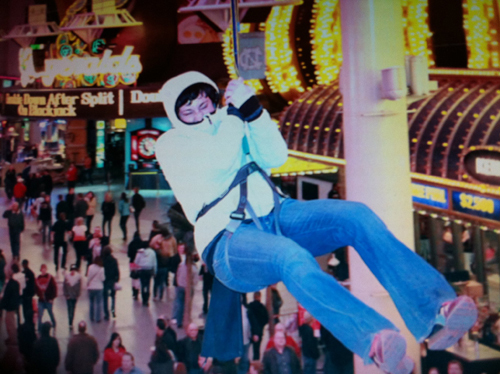 When we got down town there was a constant zing overhead as the zip lines were constantly running. It was only $20 a ride so we decided to give it a try. It was a pretty shaky looking scaffolding structure that you enter from the 5 floor of a parking garage. The line was about 35 people long and seemed to take forever because the temp had dropped that nite. The ride lasted about 20 seconds and took you half way down the a constantly lighted Freemont Experience. Maria grabbed these pictures of pictures on her phone from the guys trying to sell us “commemorative photos” for $20. Sedona I’m glad I got to knowya! 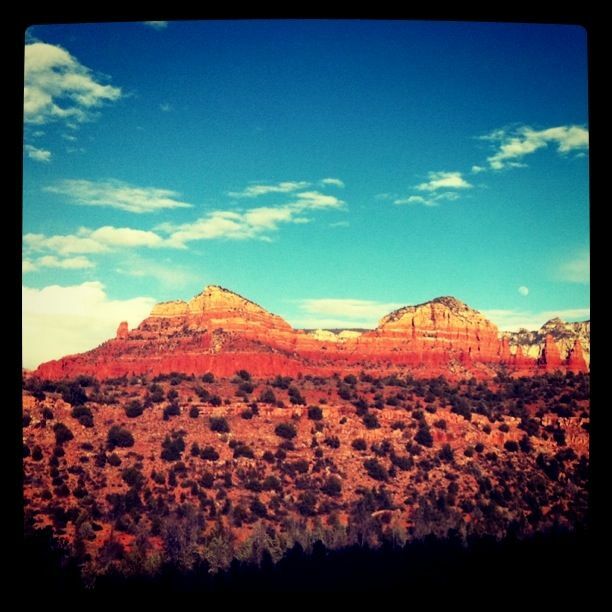 Here are some pics from our time in Sedona. We stayed with our good friend Brenden and his girlfriend, Britta, in Cottonwood, about 20 minutes from Sedona and Jerome. They were the most excellent hosts taking us around to places Stanley shouldn’t dare go, including a killer hike up to Cathedral Rock. Luckily, it didn’t kill us, but the views sure did stun us. We hope to return next October to hit up the Grand Canyon, Page AZ and St. George area with them. The post is short and sweet, because the pictures say more than my words could ever paint. The moon made a surprise appearance! We climbed to the top of that notch right about there. And a refreshing brew to end an outstanding day! 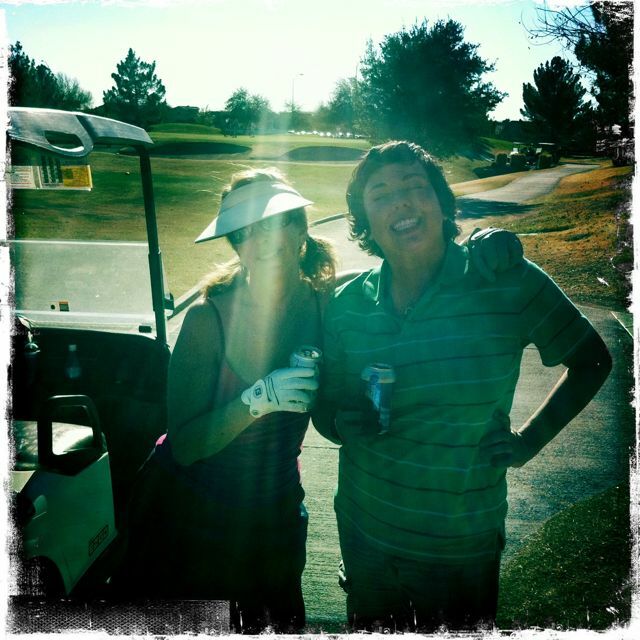 Maria and I probably had our best round of golf ever! 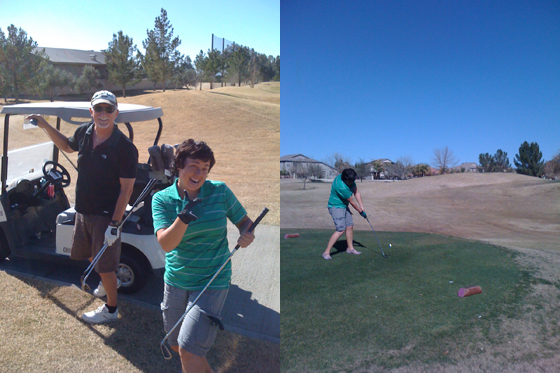 Didn’t hurt that most of the holes we could tee off with our 9 iron. Left: Bill and Maria Right: Maria about to crush it! After golfing we headed back to the RV resort for some hot tubbin and noodle floating. It was a quick relax in the sun before we headed off to hash. Drinking and running? Sounded good to us and to top it off it was a PBR hash. Which meant we were drinking nothing but Pabst Blue Ribbon all night. A few runner’s called “hare’s” are set off about 15 minutes before everyone else to go and mark the path. They will mark the ground with chalk symbols and dollops of flour to mark the path. Three true path marks in a row means you are on the right trail. There are false trails that will lead you off in the wrong direction. “YFB”. At one point we were drinking in a random ally and another we were drinking on top of a parking garage in downtown Phoenix. When the run is over, the whole group forms a circle and shares “stories from the trail”. These are incidents of un-Hasher like behavior that result in public shaming in the form of beer consumption called a “down-down”. Drinkable offenses include competitive behavior, wearing new shoes, coordinating your outfit to well, or pretty much anything that someone thinks is funny. Hashes usually have themes. 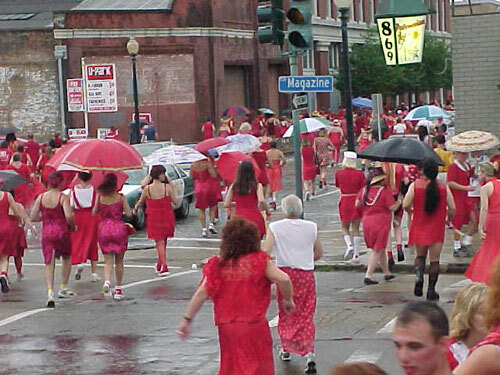 A well known hash is the "Red Dress Run" in which men and women take to the street in search of beer in red dresses. We had a great time as this community is extremely fun and energetic. Now everytime we go to a new city we are looking for Hashes. 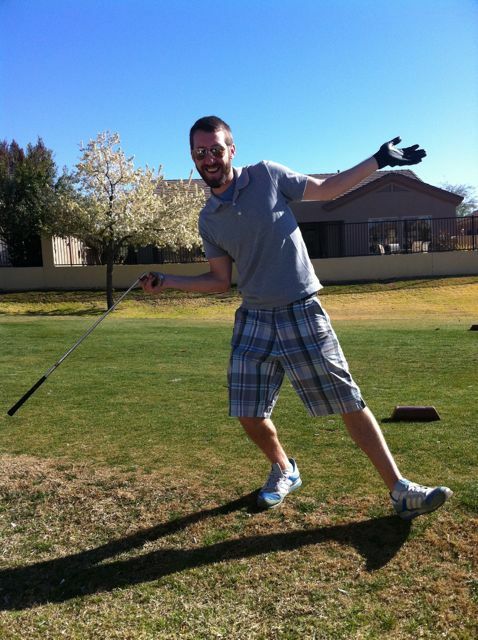 You can usually find one by typing in Hash House Harriers and the name of the city into a search engine. We think some of our friends back in KC might really like this too, so hopefully the hash groups in Kansas are as crazy as the Phoenix and South Lake Tahoe hashers we have met.